The Toronto Maple Leafs defeated the Buffalo Sabres, while the Montreal Canadiens handed the Ottawa Senators a loss in Saturday's NHL preseason action. 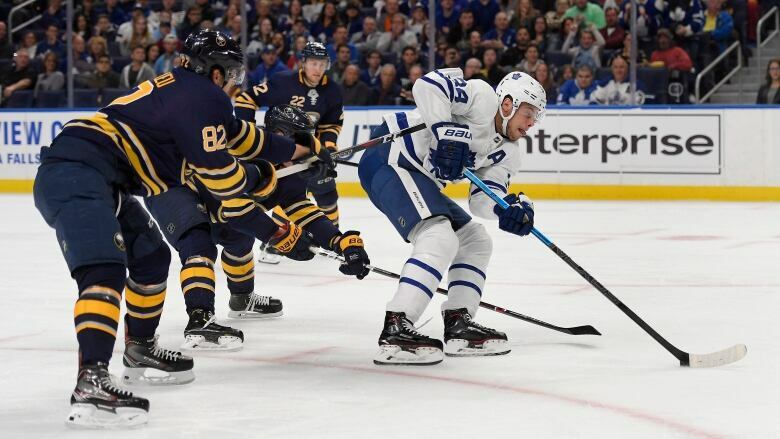 Calle Rosen's power-play goal midway through the third period was the difference as the Toronto Maple Leafs beat the Buffalo Sabres 3-2 on Saturday to remain undefeated in pre-season play. Rosen's point shot through traffic broke a 2-2 tie and moved Toronto to 4-0-0 in exhibition action, including back-to-back wins over the Sabres after a 5-3 victory on Friday in Toronto. Auston Matthews and Jeremy Bracco also scored for the Maple Leafs. Frederik Andersen stopped 19-of-21 shots before giving way to Calvin Pickard for the third period. Pickard stopped all 14 shots he faced in a busy 20 minutes. Kyle Okposo and Jeff Skinner scored for the Sabres. Carter Hutton played the entire game and turned away 28-of-31 shots in the defeat. Okposo opened the scoring 4:17 into the game with his first of the pre-season and it stayed a 1-0 Sabres lead until Matthews responded early in the second period. Matthews' second goal of the pre-season was assisted by Tyler Ennis, who is getting a chance on Toronto's top line with Willliam Nylander out with a contract dispute, and Patrick Marleau. Tomas Tatar scored early in the third period as the Montreal Canadiens came back from two goals down to defeat the Ottawa Senators 3-2 in pre-season play Saturday. Nikita Scherbak and Paul Byron also scored for Montreal. Carey Price made 15 saves on 17 shots. Brady Tkachuk and Cody Ceci found the back of the net for the visiting Senators. Craig Anderson, making his second pre-season start, stopped 29-of-32 shots. "He's got a lot of enthusiasm," said Guy Boucher, Tkachuk's coach. "A kid that's not just physically strong. He's extremely open, very coachable. So that's fun for a coach. The minute you ask him something, he does it right away." The Canadiens outshot Ottawa 32-17. Montreal scored two goals in 23 seconds to start the third period to complete the comeback. Byron netted the equalizer with a seemingly harmless wrist shot at 1:18 and Tatar deflected a shot from the point at 1:41 to give Montreal the 3-2 lead. It was the first pre-season meeting between 2018 first-round draft picks Jepseri Kotkaniemi and Tkachuk. Montreal selected Kotkaniemi third overall, while Ottawa chose Tkachuk with the very next pick. Tkachuk got the Senators on the board just 1:15 into the game as he beat Price between the pads on a breakaway — Ottawa's first shot on goal. Ceci doubled Ottawa's lead at 17:41 of the second period with a wrist shot from the faceoff dot to Price's left. Tkachuk won the faceoff that led to Ceci's goal. Montreal got one back at the end of the second via a tight-angle shot from Scherbak, who just threw the puck on net from the corner of the ice. Mark Stone nearly equalized in the game's final minutes, but his shot rang off the post. Austin Czarnik scored three times Saturday night to lead the Calgary Flames to a 5-2 victory over the Vancouver Canucks in pre-season play. Mikael Backlund and Mark Jankowski, into an empty net, also scored for Calgary. Elias Pettersson and Brandon Sutter scored for the Canucks. Czarnik is making the most of his opportunity to be a full-time NHLer for the first time at age 25 after being signed in the off-season to a two-year, $2.5 million deal. He spent three seasons in the Boston Bruins organization before heading to Calgary. Czarnik signed with Boston in the spring of 2015 after graduating from Miami University of Ohio. The five-foot-nine right-winger got into 59 games (5 goals, 12 assists) with the Bruins over his three years, but spent most of his time in the American Hockey League with Providence. Last year, he finished third in scoring with 69 points (25 goals, 44 assists) in 64 games. Czarnik opened the scoring at 6:20 on a power play, neatly completing a tic-tac-toe passing play with Matthew Tkachuk and Backlund.